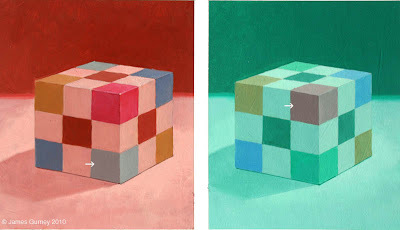 The painting below show the same colorful cube in red light and green light. The squares on the cube are cyan, magenta, ochre, blue, and white. Or so they seem. What colors are those squares really, objectively? In fact, the cyan square in the bottom corner of the red-lit scene is exactly the same color mixture as the red square in the upper corner of the green-lit scene. This phenomenon is called color constancy. We interpret local colors as stable and unchanging, regardless of the effects of colored illumination, the distractions of cast shadows, and the effects of form modeling. Here’s another example. This powerful optical illusion, created digitally by R. Beau Lotto, is called the cross-piece illusion. Two bars made up of colored cylinders, meet in a junction piece. In one picture, the cross-piece looks blue-gray. In another it looks yellow. In fact it’s precisely the same color. At this link, you can view the illusion with a slider to isolate the actual color. A fire truck looks red, regardless of whether we see it lit by the orange light of a fire, the blue light the twilight sky, or a blinking light of an ambulance. If the truck were parked halfway in shadow, we would still believe it to be a single, consistent color. If the fender were dented, the tones of red reaching our eyes would change, but we would still believe the red to remain the same. Our visual systems make such inferences automatically. Color constancy processing happens unconsciously. It’s almost impossible for our conscious minds to override it. There's a TED Talk on this! I'm going out on a limb here and say this is bogus! I think a special computer FX is at play here… No, No, wait a minute! A TED Lecture! Thanx Natalia!! (That LottoLab must be an amazing place). I need some new eyes, I can't trust these ones! Your cube example made my jaw drop... It's always so hard to imagine how much our color perception is influenced by surrounding colors. I am so confused. What can be concluded from this? If I look at Zorn pictures on the computer all day, then walk around will my eyes seek out objects that fit those color schemes or will my mind create those color schemes in objects that dont neccessarily fall into the Zorn mixes? Dare I say constructed inspiration. Neato. That crossbar thing is so amazing I had to download the image and check the colors with the eyedropper tool of the gimp. Holy crap, not only are they the same, but they are *gray*. I've run into this exact problem with multiple paintings and I was having so much trouble understanding why. I was attempting to paint a creature with a grey skin (In multiple different paintings) but the color kept coming out green, yellow, or blue. Now I realize it was due to my underpaintings. 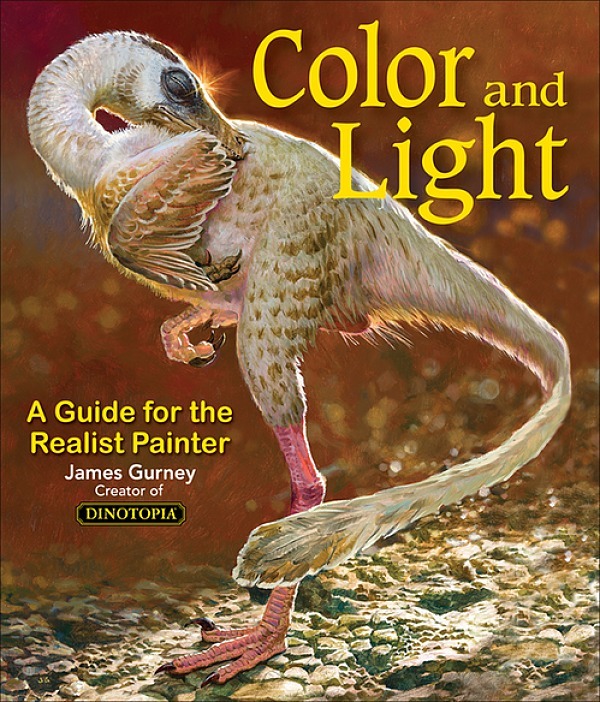 I wonder, then, how one would paint a grey-ish creature with some reds and/or greens in the underpaint to look more like skin, but still having it look grey overall. Would you just use a washed out complimentary color, or would you have to alter the colors of your underpainting altogether? That's astonishing, I've seen many optical illusions, but these are by far the most impressive. I did exactly the same as stevec, I had to check. @K. W. Broad: for your object to look gray in a colored background, you have to use the same color, not the complementary (and vary a little around that color). Edwin Land (the inventor of Polaroid) did a great lecture on this topic. It was broadcast by the BBC in 1985 as part of a film called "Colourful Notions". It doesn't seem to be on Youtube, but Googling "Colourful Notions" will lead you to some torrent sites that have a version of the film. Without isolating the arrowed cubes in question, it's definitely impossible for my conscious brain to "see" that they are the same colours. Thanks for this mind-exploding post. also, I think the important thing to remember is that in all these examples, the ambiguous colours are grayish. I guess that is because near-gray colours can really go either way. Really interesting illusion, I love the first example of the cubes, I wouldn't have thought those to be close let alone the same hue and val. The second one that is done digitally is wrong though. I know the principle is right, but the visual is wrong. 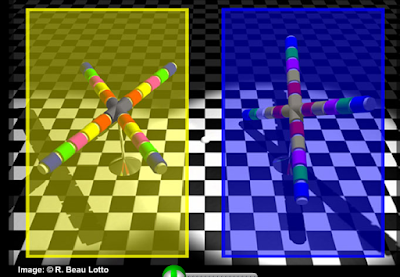 If the colour of the cross piece under the blue filter were to appear as similar to the yellow rings on the bars, the visual of the same scene under the yellow filter on the left cannot be true. The light would have to affect the two pieces in the same way. Josef Albers would have loved the comments that resulted from this post. 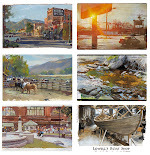 The idea of color constancy (a phenomena not a fact..just like the moon illusion) is one of the most important of all lessons for painters because a painter has to see objectively, and witness how a red firetruck is in fact not constant. The red is different in daylight, streetlight, shadow,etc...This is the fundamental lesson of Albers' Interaction of Color, that although we may always recognize the "red" of the truck, it has in fact changed. Color constancy is a phenomena not a fact. If you take a swatch of red and place it on white, it is dark to some degree. On black, the same red will glow and appear to be a different color. If you mix a color on your palette and believe it is what you are after, you may be frustrated by how it appears different when placed in the context of your painting. So how does anyone working with color address this...There is very little fact when dealing with color and when you accept that, you will begin to see objectively and witness how the firetruck is in fact different in every situation. There is no "local" color for a firetruck, only a firetruck against white, a firetruck at night, a firetruck in yellow morning light, and a firetruck in pink dusk light. None are wrong and none are local. Thanks for your post. I wonder in what way this effect is related to 'photo-dependency' of images -- If one were to filter a photo to compensate for this effect -- substituting 'perceived' colors for actual colors, would it make an image look less photographic? Thanks, everyone for all these great comments and insights. John, to your last question, yes, I think a painting keyed heavily to a color family contributes to a photographic impression, because our own visual system has a "white balance" function (called chromatic adaptation), which automatically corrects for a color cast. Cameras, when the auto white balance setting is off, often give us these color-drenched impressions. I should probably add that I did the colored cube paintings entirely from my imagination. Thanks for your article! I just watched the documentary about color illusion on TV.but that made me more curious about mystery of color so I searched. And now I understand more how colors work! Really awesome isn't it? Actually it has more to do with your brain than eyes. when the light information reaches your eyes it moves on to the brain unchanged. It's when the information travels through the brain is where the change occurs. I just wrote my graduate dissertation about this subject (color constancy and how it can be applied in a rational approach to painting). 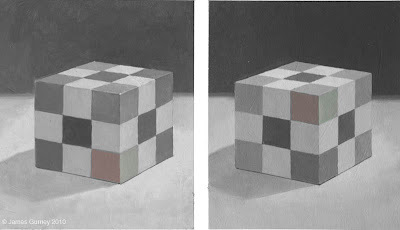 It is a paper about an evidence-based approach to painting empirically-accurate-perceptual-color from direct observation in different scenarios involving variables in luminance, reflectance, and transmittance. It is supported with experiments and data analytics. The language is meant to be understood in layman's terms by painters, so care was taken not to use a language only understood by physicists and color scientists. The dissertation was for my master's degree in arts and technology at the Department of Computer Science at the University of Texas. I am hoping to have it published in Leonardo science journal. That is in the hands of the editor. I have to say this blog is what got me started. Thank you for the inspiration. Kenneth, congratulations on writing your dissertation on this topic. I hope it gets published and reaches all the people studying in the field. You're right: translating the technical language is key to making this information accessible to working artists.